Therefore, I have roughly one month and a few days to arrive in Colorado. I need places to park my Chevy Astro van, and recharge my car batteries. What places do you recommend I visit? What are some good tourist attractions? 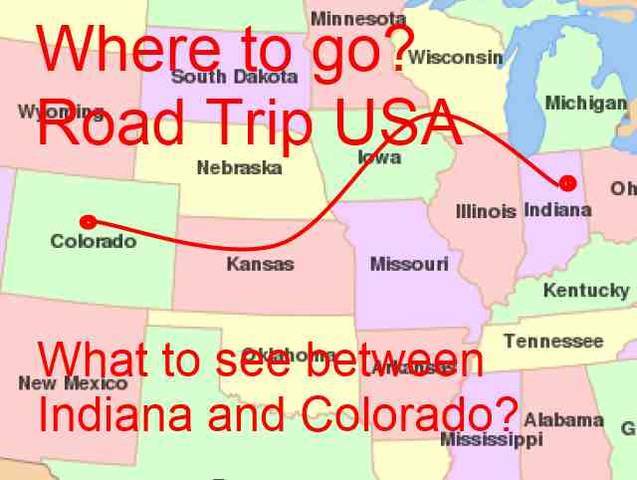 What are the fun cities between Indiana and Colorado. I suspect, I will go to Bloomington, Indiana, then go back up to Indianapolis to take the 70 route toward Colorado, but who knows...? I do not make many plans, they always seem to change, I am Hobo at heart. South Dakota may still have some snow or an early snow storm. But you might be able to see some buffalo and eat a buffalo burger. If you go through Nebraska you might check and see if there are any air force museums where you can see some of the aircraft we used in the past. I think Offutt Air Fore Base is in Nebraska. The Strategic Air Command Museum is about 30 miles from the Air Force Base at the town of Ashland, Nebraska. It is close to interstate 80 so you would not have to go far off of interstate 80. I liked Cody Wyoming but it is a little out of the way for you. I also like Salina Kansas and stopped frequently at the truck stops at Salina. It sounds like you will have a really interesting trip. The Astro van does not have cruise, I was going to price after market cruise control.